When rigging your W fishing kayak with an electric trolling motor, you face the choice of attaching the motor in the front of the kayak, in the rear, or on the side – next to you. Each of these locations offers certain advantages, and presents disadvantages as well. The motor’s location can affect safety, stability, speed, steering, tracking, entry and exit, reentering, as well as fishability, since the location of the motor and steering handle could limit your range of motion when casting baits and lures, reeling in the fish, and landing them. This is why you’d better study whatever information is available on these subjects, and see what configuration best fits your personal transportation and fishing requirements. This ‘road bike’ look and feel is partly due to the lowered seat and generous cushioning. It’s possible to install the motor in the front and steer by means other than a handle. 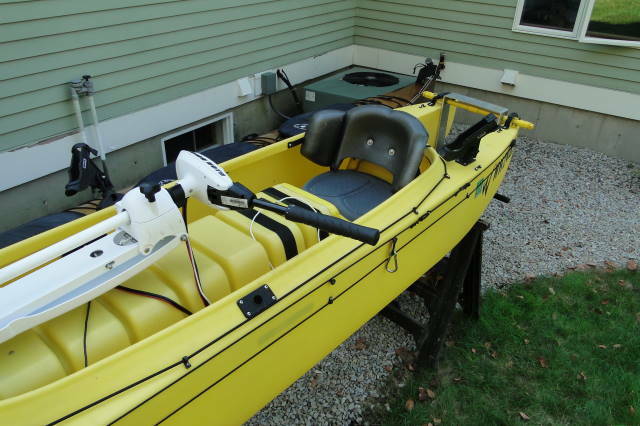 In any case, attaching the motor in the front of the kayak can create a safety issue when navigating in shallow water, as the motor won’t bounce up if it hits bottom, or a submerged obstacle. In such case, the motor could be damaged, as well as its mount, and even the kayak itself. As far as steering is concerned, the driver being located away from the motor limits their effective range of turning. This is not necessarily a problem, unless you want to make sharp turns, or in case you need to navigate through fasts streams and turbulent waters. Jim’s kayak outriggers are his own design, and he made them all by himself. It’s possible to find many examples for this in reviews of fishing kayaks contributed by anglers. From an Electric Trolling Motor To an Outboard Gas Engine – New Trend in Fishing Kayaks? Here is the test ride, it was awesome! I had a late start today, didn’t hit the water until 2pm. Cloudy, windy and water temps were 53. Today was my maiden voyage in the W500 with my 1.2hp Gamefisher outboard motor. It Was AWESOME, I had so much fun, the W500 handled like always – Stable, stable and yes Soooooooooo Stable. The motor made no difference in the balance, it was like the kayak was meant to be used with a gas outboard. I even stopped to fish a little, maybe 1/2 hour was spent on fishing. All smallies came out of the channel in 10′ to 16′ of water. Rattle Trap was really the only lure I tried, time was short. Only 2 Smallies were picture worthy, lost a beast, and landed 6 that were cookie cutters, 13″. These 2 Big Girls hit the RT like a freight train. They both did circles under water putting a good bend in my Med/Hvy BPS rod before coming up and jumping like crazy even with the cold water temps. This article describes the challenges facing the designer of a stable fishing kayak, the factors contributing to kayak stability, and the optimal solution achieved by applying both classic naval design and Micronautics in the design of W fishing kayaks. Stability is a key factor in kayak design, judged by the number of kayaks designed to offer more stability compared to kayaks designed with little or no regard to stability. The latter types are kayaks designed for rolling, and they sacrifice stability for maneuvering capability in the case of whitewater kayaks, and for speed, in the case of racing kayaks and sea kayaks. These applications are practiced by a relatively small number of kayakers, and they do not show a tendency to gain in popularity. It’s possible to argue that in a broad perspective, the unstable kayak is a failed experiment, or an evolutionary dead end. All other kayaks are not designed for rolling, and their main safety attribute is the stability they offer, to variable extents. This stability is what helps the kayaker and kayak angler prevent their kayak from flipping in case they lose balance. The kayak market opted for stability in the recreational, day touring, and fishing applications. Together, these three segments constitute the bulk of the kayak market in terms of sales and participation. The attempts to paddle kayaks and boards in the standing position (SUP), as well as talks about stand up kayak fishing reflect a need for stabler kayaks. As for fishing kayak propelled by pedal drives, since this method of propulsion results in the kayaker losing some control over their kayak, including over lateral its stability (balance) to a certain degree, it demands kayaks that are stabler, by definition. Needless to say that as motorized kayaking and kayak fishing gain in popularity, so will the need for stable kayak designs increase, whether it’s for recreation, touring, or fishing. This article avoids discussing the difference between Initial (primary) Stability, defined as what the kayaker feels in normal circumstances, on flat water, and Secondary Stability, which is what they feel once the kayak has been destabilized, and it’s tilting on its side. The reason for this being that we think of stability as one quality in various conditions, and we maintain that under normal conditions, the kayaker should not be required to make any effort to stabilize their kayaks, or even pay attention to their being in a kayak. This approach is different from the traditional kayak design approach that’s applied mainly to the design of very unstable kayaks such as whitewater and ‘sea’ kayaks. This approach assumes that passenger would roll the kayak if they got destabilized, rather than simply right it. How To Design A Stable Fishing Kayak? Compared to other small boats, such as canoes and dinghies, kayaks are narrow, by definition, because they are mostly solo boats that are paddled from their middle section, by means of a dual blade paddle. Kayaks that are too wide become too hard to paddle, not just as a result of the paddle strokes becoming less efficient, and therefore less effective, but also because such kayaks are slow due to poor hydrodynamics, they track poorly, and they require the use of a rudder, which further slows them down, as well as makes operating them more complicated. Making a heavy and cumbersome boat and labeling it ‘kayak’, or ‘hybrid kayak’, may be a good marketing tactic for some manufacturers who want to address the kayak fishing market, but it makes no sense in plain, technical terms, and from a user’s perspective. At some point, it becomes too hard and complicated to paddle such ‘barges’, or car top them, and that’s when they lose the right to be called kayaks, and earn the right to belong to another category of small boats. Kayaks are mostly human powered, which means they suffer from a severe power deficiency, which restricts their hull design to forms that are sufficiently efficient in a displacement mode – No planing and no hydrofoils for the common kayak used in the real world for everyday applications, by people who are not kayaking champions… This power restriction also limits the use of outriggers as stabilizers, since outriggers generate much unwanted additional drag, thereby making it to hard for the common paddler, or angler, to paddle kayaks outfitted with such devices. Fishing out of a kayak involves performing hard physical tasks on the sides of the kayak, such as casting, and landing fish. While doing so, the angler cannot use their paddle in order to balance their kayak, and they have to rely entirely on the kayak’s basic stability. Being limited in its width, overall size, and hull form, the kayak can offer limited stability. This is not good news for kayak anglers, since fishing out any boat requires it to be stable. The limits of the kayak’s stability are defined by its volume, and its width. The volume corresponds to the kayak’s Buoyancy, or its ability to float and support additional weight without sinking. As the kayak loses its balance, weight gets quickly shifted away from its center to one side, and this extra weight pushes this side downward. If the kayak side is supported by a sufficient amount of buoyancy, it will sink just by a small amount, and offer the kayaker sufficient time and support to regain their balance and right their kayak. If the kayak’s side is not supported by enough buoyancy, it will tip too fast and too low, and thus make the kayaker lose their balance, and capsize their kayak. The further away from the kayak’s center line, the more effective the kayak’s buoyancy becomes in supporting its sides, I.E. for stabilizing it. In other words, for every cubic inch of the kayak’s volume, the distance from the kayak’s center line works to increase the leverage and stabilizing effect: A cubic inch of the kayak’s buoyant volume located along the kayak’s center line has zero stabilizing effect, while a cubic inch of buoyant volume situated at the very far side of the kayak provides a maximal stabilizing effect, for a given kayak width. For example: For a kayak that’s 28 inches wide, one cubic inch of buoyancy located at its far side, at a 14 inch distance from its center line, provides 14 times more lateral support than a cubic inch located 1 inch from the center line. This is means it’s 14 times more effective in terms of stability. In other words, if we look at a given kayak volume in cubic inches as an asset that we need to allocate in a way that would maximize the kayak’s stability, we should avoid placing any units of buoyancy (e.g. cubic inches) along the kayak’s center line, or close to it, and allocate as much buoyancy to areas located as far as possible from the kayak’s center line, namely along the kayak’s two sides. Practically, this means the kayak’s center line should not be in contact with the water at all. In other words, we need to give the perfectly stable fishing kayak two hulls – one on each side, thus making it a twin hull. A kayak going in water has a total mass, which includes its own mass, and the bigger mass of its operator. This is a classic case in which traditional naval engineering should be complemented by Micronautics. For the purpose of keeping this article simple, we’ll treat mass and weight as the same thing, and describe the kayak’s center of mass as its center of gravity (CG). The kaya’s CG is located above its center line, and because the kayaker is heavy and sitting upright, the kayak’s overall CG is situated quite high above waterline. When the kayak gets destabilized, it means that its CG shifts to one side, sometimes rapidly, and in some cases to a great extent. The higher the kayaker is seated, the more leverage its own CG has on the mass combined of themselves and their kayak. This means that a kayaker sitting on top of a kayak, such as when paddling a sit-on-top (SOT) kayak, or fishing from it, is less stable than a kayaker seated at the bottom of a sit-in kayak. Going back to our ideal stable kayak form, which is a twin hull – A traditional catamaran design would imply that we connect the two hulls by a platform, and let the kayaker operate their kayak while seated on top of this platform, as well as fish from it while being seated in the traditional L position, similarly to a SOT kayaker. This has been tried in the past, and similarly to the SOT result, it was sub-optimal due to the fact that the kayaker’s CG was too high, and the L position offered no advantage when it comes to reacting to lateral forces, whether while paddling or when fishing. The combined stability and ergonomic problem described above was solved in the W kayak by designing deep, hollow hulls for the ideal stable kayak, and enabling each of the operator’s legs go in its own hull, all the way down, with feet firmly resting on the bottom – that is below waterline, as low as possible. This took some of the kayaker’s weight and redistributed it lower than it would have been if the kayaker was seated in the L position. By that, the kayak’s CG was lowered as well. 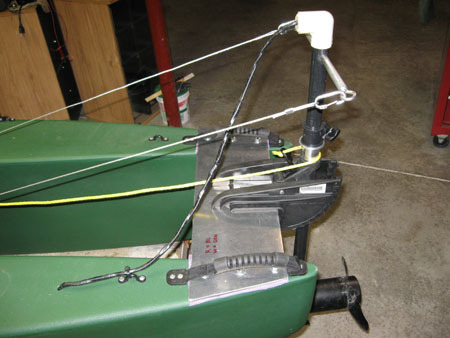 In addition, placing the kayaker’s legs in the hulls offered the kayaker better leverage on the kayak, by enabling them to use their legs intuitively and effectively for balancing and stabilizing the kayak, and doing so by applying their weight on the bottom of the hulls, instead of on the top of the deck. This advantage can be described as ‘active ballasting’. It is comparable to the advantage achieved by ATV, snowmobile and PWC drivers, who operate their vehicles from similar riding positions. Fishing kayaks are wider than the average kayak, but although it’s one of the narrowest fishing kayaks (just 28.5″ wide), the W500 is the world’s stablest fishing kayak. 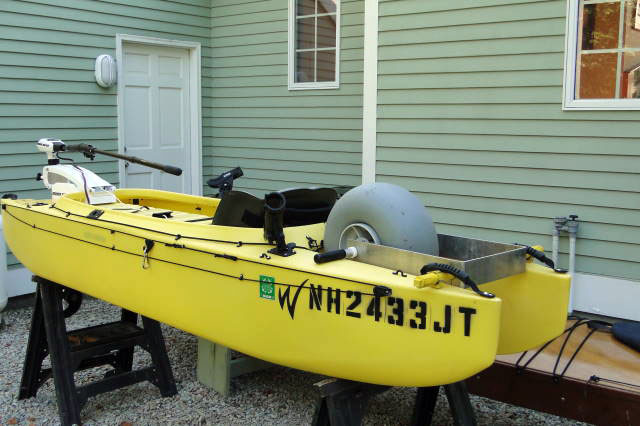 In fact, it’s even stabler than fishing kayaks outfitted with outriggers. Due to its narrowness, narrow hulls, and improved ergonomics, the w500 is faster than most fishing kayaks, including some that are considerably longer, and many touring kayaks as well.